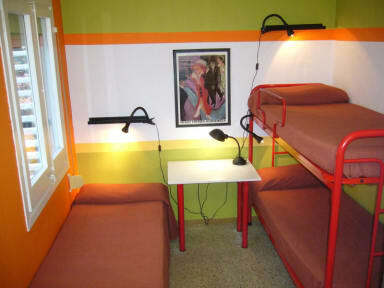 We are a quiet, safe, and inexpensive hostel located just minutes away from Barcelonas city center. Our guests rate us most highly on our customer service, as we are AVAILABLE 24 HOURS a day to help you find landmarks, arrange transportation, and navigate the city. We have free breakfast, free and fast WiFi, and use of public computers. We have a rooftop terrace and coin operated laundry facilities to make your stay more comfortable. If you are arriving by car, we have free on-street parking, which is otherwise difficult to find in this large city. Within walking distance of our hostel are the following: supermarkets, banks, clothing shops, restaurants, tapas bars (Bar Tomas), coffee shops, bakeries, and a traditional Spanish market. The metro station, Reina Elisenda, is 50 meters outside our front door, and will take you directly to many tourist areas, including Plaza Catalua (historic Barcelona) and Porto Olimpico. Also nearby via metro or bus are Sagrada Familia, Parc Guell, and the beaches. The football stadium is a lovely downhill walk, just 30 minutes from our hostel. 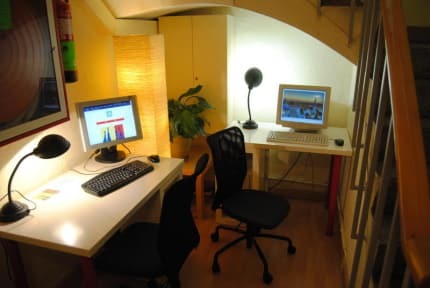 Here at Albergue Studio, you can print or make copies, use our food preparation facilities (microwave, oven, fridge, hot water kettle), rent towels, and lock up your valuables in our security lockers. You can also relax while watching TV in our lounge, play chess, or challenge a friend to a game of table tennis in our game room.